CARACAS, Venezuela – Venezuela has responded to Guyana’s declaration that it intends to fight that country’s move to claim territorial waters, warning that the government should rectify its “dangerous, provocative policy” immediately. Guyana on Monday said it would not stand by and allow its rights to be trampled, after Venezuela’s president Nicholas Maduro issued a presidential decree claiming more than two-thirds of its territory, including the maritime area where American oil giant ExxonMobil recently found significant oil deposits. “Any attempt by the Bolivarian Republic of Venezuela to apply that instrument in an extra-territorial manner will be vigorously resisted,” the statement said, as it described the decree as a “flagrant violation of international law”. However, Venezuela said the decree was “an administrative norm directed at organizing the everyday work of maritime supervision and protection”. It accused Guyana of trying “to create an artificial crisis, inventing irrational situations against a brother country like Venezuela, and using highly offensive language”. “It is unacceptable that the new government of Guyana take this position with a territory that is under dispute,” Venezuela’s foreign affairs minister Delcy Rodriguez said. 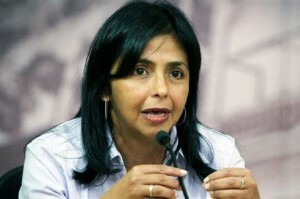 She added that the new David Granger-led government showed “a dangerous provocative policy against a peaceful Venezuela, backed by the imperial power of a US transnational, ExxonMobil, which should be rectified immediately”. While Guyana said that Maduro’s May 27, 2015 decree presented a threat to regional peace and security, Rodrigues said “the only surprising threat is that the government of Guyana allowed a powerful transnational [company] such as Exxon Mobil to venture into territory disputed between two countries”. Venezuela had objected to ExxonMobil’s oil search, writing the oil giant to warn that it would not accept the interference of a multinational company in the disputed territory. Rodrigues has invited her Guyanese counterpart to dialogue to resolve the matter.